A finite state machine is a form of abstraction (WHY/HOW?). It models the behaviour of a system by showing each state it can be in and the transitions between each state. Form the above we can draw the finite state machine for the elevator. Representing a system as a finite state machine is very powerful because the model allows us to demonstrate the behaviour very clearly. We can prove that the system is robust and will not behave in any unexpected manner. Consider the example of the elevator: by modelling the system as a finite state machine, it is possible to show that the elevator is not able to move up and down without stopping. This is because the design clearly shows that it is impossible to transition from the state 'moving up' to the state 'moving down'. 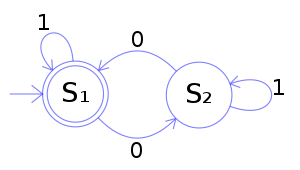 Applications of finite state machines are found in many sciences. Mainly engineering, biology and most commonly in linguistics, where they are used to describe languages. I am stuck in state S2 and the FSM has not accepted. Can you create a FSM to only accept Binary numbers with odd numbers of 1s? Shifting all the bits right, and dividing the binary number input by two. What does this machine do, what do the outputs tell you? What is the difference between a mealy machine and a finite state automaton?